The first GIS of the world was operated in 1962 in Ottawa (Ontario, Canada), by the Federal Department of Forestryand Rural Development. It was developed by Roger Tomlinson for the management of the vast natural resources of the country with cartographic information on types and uses of soil, agriculture, recreation, wildlife, waterfowl and forestry spaces. However, there were other less environmentally-related sectors that tried to use systems or organizations of geographic data for decision making in the history of GIS. For example epidemiology, a scientific discipline that studies the distribution, frequency, determinants, relationships, predictions and control of factors related with health and various diseases existing in specific human populations. Human epidemiology occupies a special place in the intersection between biomedical sciences and social sciences. Indeed, one of the first applications of spatial analysis was used in epidemiology in 1832 in the "Rapport sur et marche les effets du cholera dans Paris et le Départementde la Seine". French geographer Charles Picquet represented 48 districts of the city of Paris using halftones according to the percentage of deaths by cholera per 1,000 inhabitants. Cholera cases mapped during the epidemic of 1854 in London. 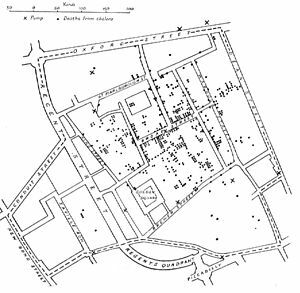 Considered father of epidemiology, Dr. John Snow leaned with a 1854 map to territorially identify cases of cholera in London, in the today glamorous district of Soho. Thanks to that map, a sort of predecessor to GIS, the scientist located the outbreak caused by one water well. 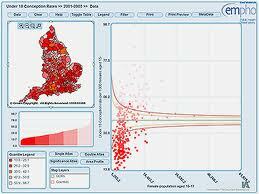 There are several programs to collect and store data and display information related to the health sector through maps. 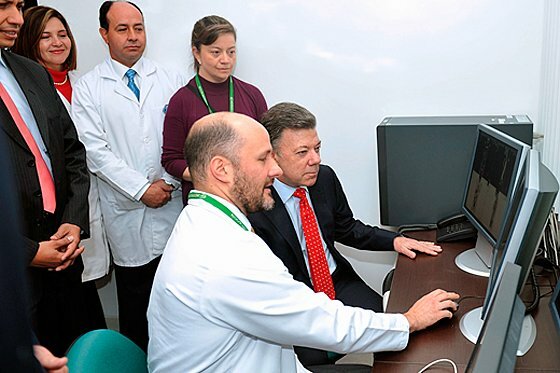 These programs include Sig Epi, SiMap, EpiMap and HealthMapper which are widely recommended by WHO and PAHO; World and Pan American Health Organization, respectively. This software is used to support the activities of public health surveillance and epidemiological activities that use systematized maps. · Identification and characterization of populations living near high voltage transmission lines. · Mapping of environmental toxic chemicals discharge. · Surveillance of vector transmitted diseases by, such as malaria or dengue fever. Although the majority of these applications relate to what is known medical science as diagnosis and surveillance of risk factors or health problems, there are many other and the possibilities of working in this field are of a wide variety.